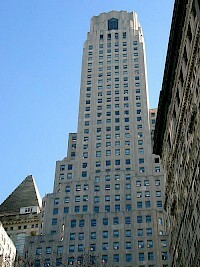 500 Fifth Avenue is a 60-floor, 697-foot (212 m) office tower in Manhattan, New York City, standing at West 42nd Street. It is adjacent to Bryant Park. 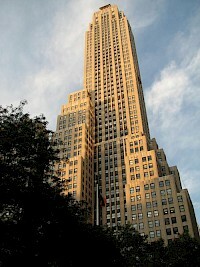 While this art deco building is not as well known as the Empire State Building, it shares a couple of characteristics. 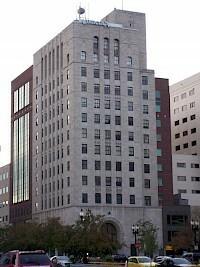 Both buildings were completed in 1931 and designed by Shreve Lamb & Harmon Associates. The DuMont Building (also known as 515 Madison Avenue) is a 532 foot (162 m) high building at 53rd Street and Madison Avenue in New York City. 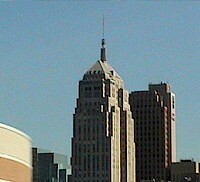 The building was built in art deco style by John H. Carpenter and designed by his brother, architect J.E.R. Carpenter who also designed Lincoln Tower as well as nearly 125 buildings along Fifth Avenue and Park Avenue. 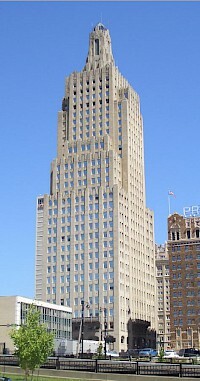 The First National Center, formerly known as First National Bank Building, is a prominent skyscraper in downtown Oklahoma City. The art deco tower is 446 feet (136 m) tall at the roof, and is 493 feet (150 m) at its spire and contains 33 floors. The building was constructed in 1931 by the First National Bank and Trust Company of Oklahoma City and has 990,000 square feet (92,000 m) of office space. The General Electric Building is a historic 50-floor, 640 feet (195 m)-tall, skyscraper in Midtown New York City, United States, at 570 Lexington Avenue (southwest corner of Lexington and 51st Street). 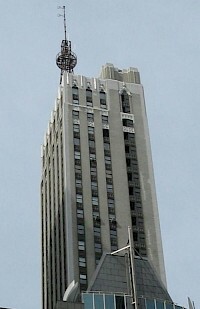 Originally known as the "RCA Victor Building" when designed in 1931 by John W. Cross of Cross and Cross, and sometimes known by its address to avoid confusion with the later GE Building at 30 Rockefeller Plaza. The building was deeded by RCA to GE before construction was completed. Nelson Tower is a 171 meter (560 feet) tall building located at 450 7th Avenue on Manhattan Island, New York, United States. 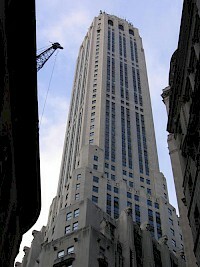 It was completed in 1931 and became the tallest building in the Garment district of New York. 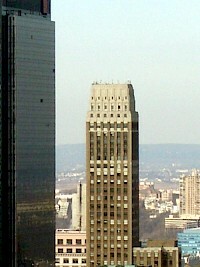 Today it is dwarfed by the 60 story One Penn Plaza that sits across 34th Street from the Nelson Tower but still visible from most directions except the southeast. It was designed by H. Craig Severance.